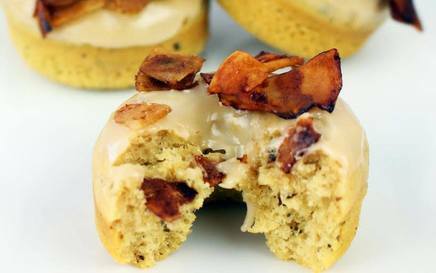 This recipe brings together two foodie favorites: smoky maple coconut Bacon and sweet, fluffy doughnuts! The doughnut is a guilt-free cake style doughnut, so no frying here, and the Bacon simply requires marinating thick coconut flakes in a mixture of soy sauce, liquid smoke, and maple syrup. The two are brought together with a drizzle of vegan fondant maple icing.